AlevelUP Basketball is more than skills and drills, we also focus on character building, and Team Leadership Skills. Leadership is an exceptional skill, great leaders can lead themselves, and their teammates to great heights, but leadership can be one sided at times and perhaps create conflict among teammates in a "team sport". AlevelUP helps build 'Team Leadership Skills" which is beneficial to all parts and to every player, help everyone can have an impact, on the team. Whether an athlete's role is great or small, from filling the water bottles, or cheering the loudest on the sideline to scoring the last bucket to win the game, each athlete has an impact and can significantly contribute to the teams end goals. 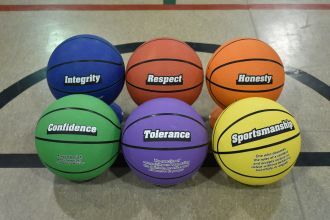 One step towards building Team Leadership is the acquisition of our new basketballs for Summer 2019. Your athletes will have fun learning while playing basketball! Some less we want our kids to learn to become great athletes and model citizen happen in environments where those skills can be learnt and applied with experience! DON'T MISS OUT THIS SUMMER! Camps in Oakville and Ajax-Durham in JULY 2019. registration now open!